Prague is a beautiful city and it has many attractions. However, in order to get to know a country better and to get a real taste of the local culture, I always recommend visiting some smaller cities. The good news is that the Czech Republic has many charming small towns and one of them is Kutna Hora. Below is my complete Kutna Hora things to do list. Read more about Karlovy Vary here. With a population of 20,000 people, Kutna Hora is situated in the region of Bohemia of the Czech Republic and was founded in the year 1142. In the early beginnings, silver was extracted from the nearby mountains, helping Kutna Hora to develop economically and politically. The flooding of the richest mine in 1546, followed by plague outbursts, led the city to ruin. Due to its importance in history, the town was added to UNESCO’s list of World Heritage Sites in 1995. Situated in Sedlec, a suburb of Kutna Hora, the Sedlec Ossuary is a must see. A resting place for more than 40,000 people, the church is built in Gothic style. While it is not a place for the faint-hearted, it is an intriguing place. The legend says that the Czech king sent one of the local abbots to Jerusalem around the year 1278. The abbot brought back a handful of soil from Golgotha and scattered the holy soil over the Sedlec cemetery. People around Europe have started to desire to be buried here. Moreover, during the great epidemics from the 14th century the cemetery started to expand and around 30,000 people were buried here. In 1421 Kutna Hora was captured by the Hussite troops. They attacked Sedlec and burned the cathedral and the monastery while the cemetery was devastated. Another 10.000 people were buried here after and during the Hussite wars. Because of the high number of people buried at Sedlec, in the 15th century the area of the cemetery was reduced and bones from graves were moved to the ossuary. According to some chronicles, the bones were already decoratively arranged in the 16th century. Even if you do not like creepy stuff, the Sedlec Ossuary will definitely impress you. Just try and think about it like a work of art. For prices and opening hours please visit this website. 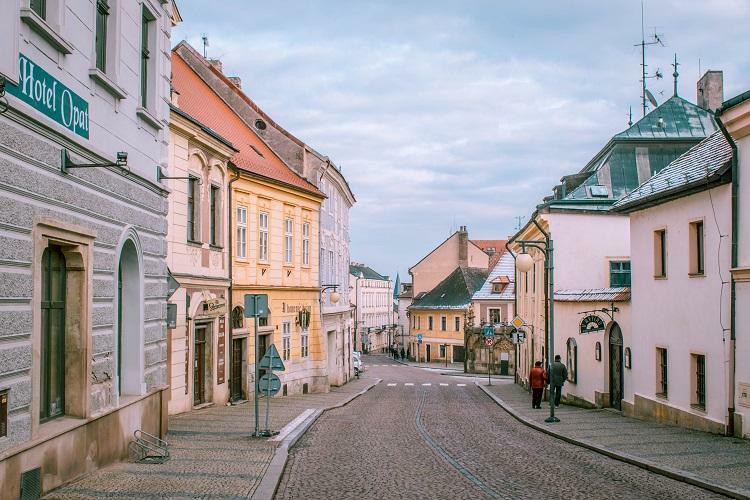 One of the main Kutna Hora points of interest is the Barborska Street. On one side beautiful statues are lined up while on the other side the impressive building of Jesuit College stands tall. This is definitely one of the most romantic places I have ever seen. It is so beautiful that some movie scenes from Les Miserables were shot here. Bonus tip: If you are looking for the best shot in Kutna Hora, go to Barborska Street during golden hour. At the end of Barborska Street you will see the beautiful Gothic cathedral of Saint Barbara. The structure is absolutely breathtaking and it was included in the UNESCO world heritage site. Saint Barbara is patron saint of miners which matches perfectly the history of Kutna Hora. Originally, the cathedral should have been much bigger but due to the decline of mining in Kutna Hora, the budget for its construction was reduced. This one room Chocolate Museum in Kutna Hora (see it here on map) has one of the best chocolate I have ever tasted. There are so many exotic kinds of sweets that it will be pretty hard to choose just one. Also, make sure to try their hot chocolate. Delicious! The museum entry is free. The factory was founded in 1918 and it exported chocolates and bombons in Europe, America, Palestine and all the British colonies under the name Lidka. Lidka was voted several times as the best chocolate in the world. Due to nationalization, the factory which used to produce more than 5,000 bonbons and export its products globally was closed in 1958. However, people still carry the tradition of making amazing chocolate these days and you can taste it at this store and museum. That being said, stop for a sweet moment at the Chocolate Museum in Kutna Hora. There are many shops along the streets which sell handmade items. Take your time and admire all the beautiful objects like home decorations or mugs. Make sure to have some money to spare since not buying anything will not be an option. There is no better way to discover the beauty of a city than getting lost on its streets. I loved all the cute cafes and chocolate stores. You will be amazed by the beautiful houses and handcraft boutiques. I cannot stress enough how much I recommend the Dacicky Restaurant. Here you can find the tastiest Czech food and my favorite meal by far is Svickova. Don’t get fooled by the way it looks because it just tastes heavenly. You can easily get to Kutna Hora from Prague by train or bus. If you decide to travel by train, the train will leave you just 10 minutes away from the Sedlec Ossuary. However, if you decide to travel by bus, the bus will stop near the city centre which is quite far from the Sedlec Ossuary. What I would recommend is taking the train and then an UBER from Sedlec Ossuary to Kutna Hora city centre. I hope you will add Kutna Hora on your travel list as it is a charming city. All the above Kutna Hora things to do can be visited during one day. However, I would recommend staying 2 days since it has so many beautiful places to visit. I hope you enjoyed my Kutna Hora complete travel guide. Previous Post 14 Free travel Lightroom presets – get them now!